I love Easter, perhaps more so than Christmas. Easter resembles all that is good in the world, doesn’t it? Spring weather, renewal, and new hope. The birds chirping, tulips blooming and we’re all filled with a new sense of optimism and assurance. 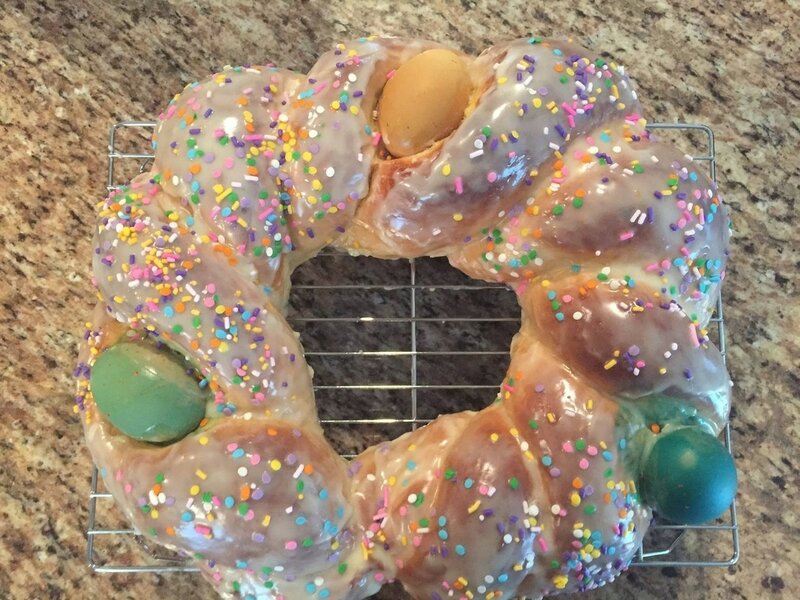 I grew up eating this bread (or cuzzupa in Calabrian dialect) every Easter. It would actually start a week or two before the holiday and my mother would either make it or buy it at the local pasticcerie. Sometimes she would make it glazed, sometimes just with a sprinkle of sugar on top. Either way, my sister and I would devour it for breakfast and afternoon merenda, or after school snack. This bread is not overly sweet, if you don’t add the icing, that is! It tastes a bit like brioche and challah bread. It goes great by itself, or simply toasted with some butter and/or jam. Topped with cinnamon sugar is also a great combo. 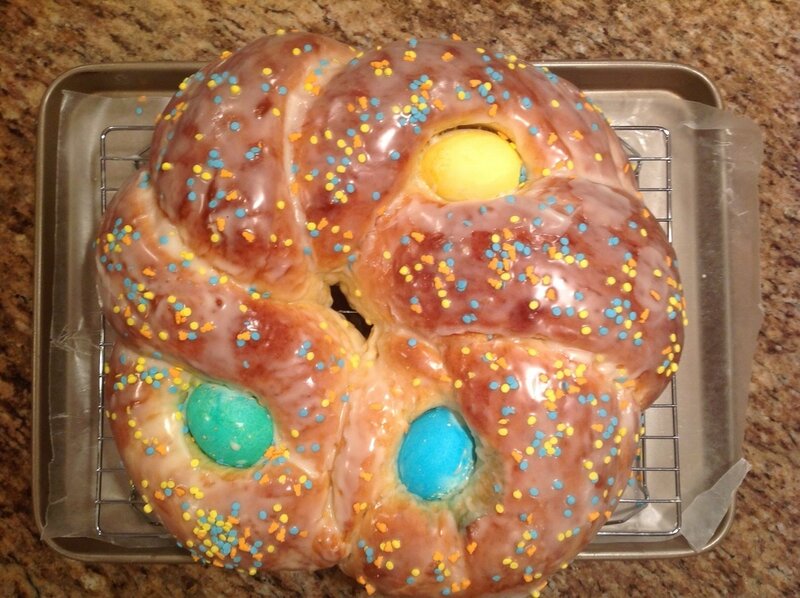 Last year, I made it twice, for Palm Sunday then again for Easter. You’ll see the two results below. I am torn about whether I like the colors on the eggs. I think this year, I will skip coloring them and use just white. No matter how I try, the color always bleeds into the bread, which makes it look so artificial and a bit messy. 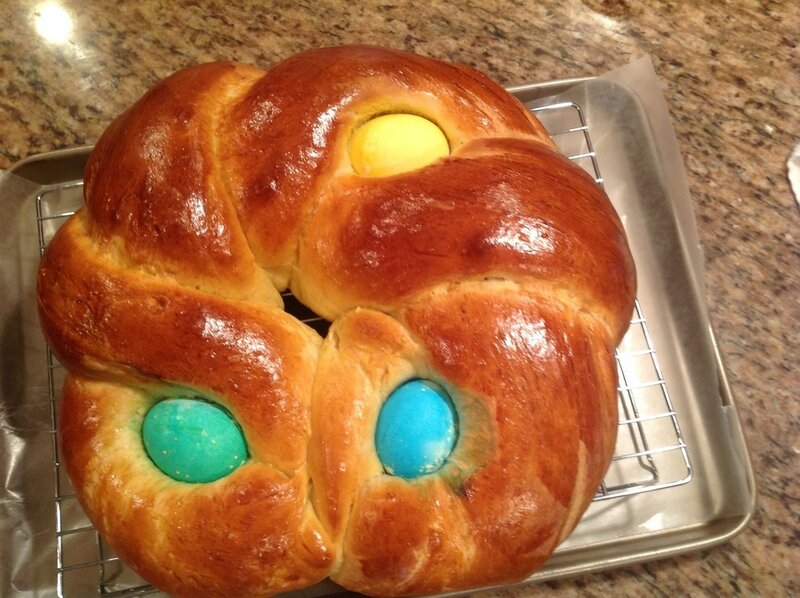 Or perhaps I’ll make two, one with colored eggs and one with white, so I can best decide which I prefer. It’s a dirty job, research really, but someone has go to do it! Tip: You do not need to boil the eggs first, they will bake in the oven, just be careful not to crack them. Also, the eggs are mostly for decoration only. You can eat them the same day you bake the bread, but once you leave the bread out a few hours, the eggs do spoil. So either leave the eggs on the bread and trash them as you eat the bread, or remove them and put them in the fridge. Since the eggs are really what ads to the appeal of the bread, I just leave them there and trash the eggs when the bread is finished. Glazed. Allow icing to dry out before moving it. Bake at 350 degrees until golden – about 40 minutes. Cool on rack.